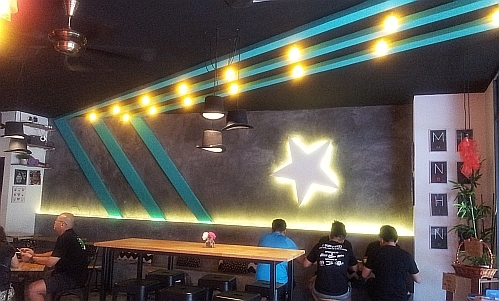 Whenever I am in this area (Arked Esplanad Bukit Jalil), I would eat at Friendship Cafe (despite its name, it is just a common coffee shop with a few hawker stalls) or at On On Bak Kut Teh (another common coffee shop nearby). On this day, Friendship Cafe was closed and it was full house at On On Bak Kut Teh so we ended up in a proper cafe. I ordered the big breakfast at MYR24 nett. I would say that it is good value for scrambled egg, 2 fluffy pancakes, 2 crispy pork belly bacon, lots of mushrooms, a big slice of tomatoes and some greens. The cup of Flat White (coffee) in the photo above belonged to my friend at MYR10 nett. My friend had the special of the day which is "Ayam Masak Merah" (chicken cooked in red sauce) at MYR17 nett. If you are not a rice person I would recommend going for the western dishes instead of the rice meals because there are better versions of this rice meal elsewhere at a lower price though this is quite a decent dish with two pieces of chicken and coconut milk rice (nasi lemak). A rather expensive brunch at MYR51 nett for two seeing that our intention was just to order from hawker stalls at a common coffee shop but ended up here. To be fair, the big breakfast is value for money. Munching Mob has been here for almost 2 years but I have never noticed it until now. 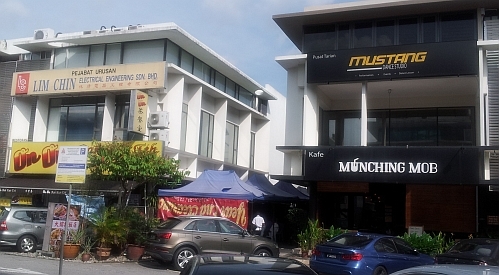 Can you spot the On On Bak Kut Teh coffee shop? Should be ok when converted to sgd. Both look good but I've got my eyes on those sausages. 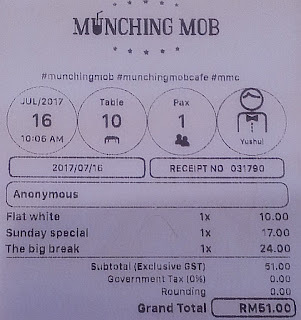 Pricing is ok for an upscale classy place like this, that is to be expected...and I do recall having a Big Breakfast at Mid Valley and that was around RM30.00! Rental in mid valley should be more expensive. 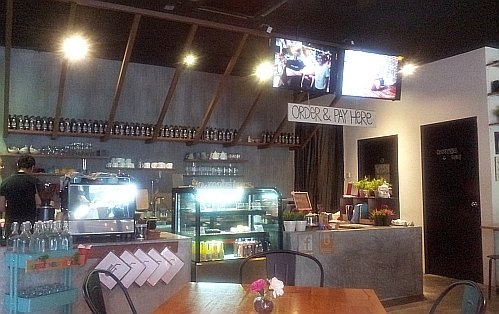 I would visit that area every 2-3 months just to meet a best friend for coffee & gossip everything. I didn't realise there are so many restaurants there & you might bump into me too. I realised today that I am a greedy fella and would eat anything. That's my answer to your idea of eating Western if we are not a rice person. No wonder, I often take too long to order from menus until my wife would frown. Oh, in that case I would have to open my eyes bigger to try to spot you. You are no longer greedy as you are eating more healthy food now. No because I share the food with my friend. Breakfast set sounds good to me. Remind me of the English breakfast in London. Yes. It just need baked beans to look more like an English breakfast. been to On On BKT twice, but I didn't notice this****SLAP HEAD! I tink my mind was only tinking about BKT during then. Me too. Didn't see this cafe until recently. Your big breakfast is so loaded. I like! Did you keep half in your container? No because I gave quite a lot to my friend. Hahaha I can't remember is it black pepper or not. Both look big portion. 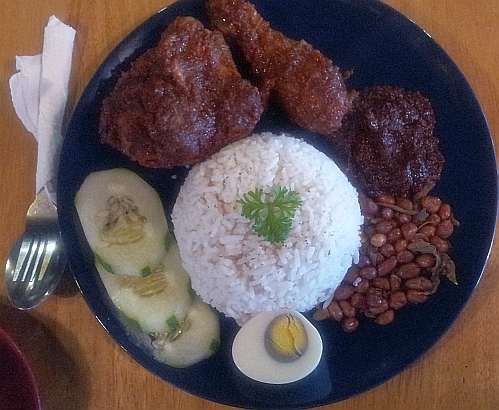 I like ayam masak merah but I would prefer to order the western brunch. Have a good day! 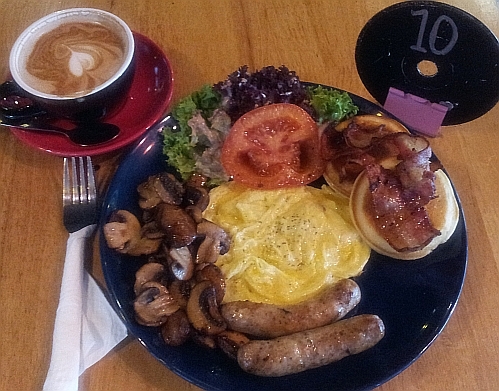 yes, at cafes like this, must order western brunch.